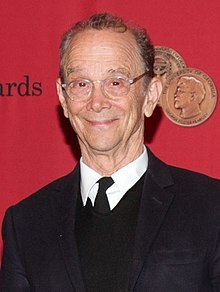 Joel Grey (born Joel David Katz; April 11, 1932) is an American actor, singer, dancer, and photographer. Gray was born in Cleveland, Ohio to Goldie Epstein and to Mickey Katz. He studied at the Cleveland Play House and at Alexander Hamilton High School in Los Angeles, California. Grey played the role of the Master of Ceremonies in the Broadway musical Cabaret in 1966 for which he won the Tony Award. Grey won an Academy Award for Best Supporting Actor in March 1973 for his performance in the same role in the 1972 film version of Cabaret. He also won the Golden Globe Award. Grey had many other successful performances as an actor. Gray is also a published photographer, with books Pictures I Had to Take 2003; its follow-up, Looking Hard at Unexpected Things 2006. His third book, 1.3 – Images from My Phone, a book of photographs taken with his camera phone, was published in 2009. An exhibit of his work was held in April 2011 at the Museum of the City of New York, titled "Joel Grey/A New York Life." In 1958, Grey married Jo Wilder; they divorced in 1982. Together, they had two children: actress Jennifer Grey and chef James. In January 2015, Grey talked about his sexuality in an interview with People, stating: "I don't like labels, but if you have to put a label on it, I'm a gay man". ↑ 2.0 2.1 "Joel Grey Biography (1932-)". Film Reference. Retrieved 2014-02-23. ↑ Joel Grey Looking Hard at Unexamined Things. Joel Grey Photographer. ↑ ""Joel Grey/A New York Life" Exhibition Will Open at Museum of the City of New York in April".